This beautiful 1½-story, single family home features an elegant oval entry with wood flooring and 13' ceilings that open to the large formal study. The extended entry with a 12' ceiling is flanked by the dining room on one side and kitchen with wood flooring on the opposite side. The kitchen is central to the home and open to the dining room, breakfast room, and family room. It features a large island, granite countertops, 42" grey painted cabinets, and 12' ceilings. The family room features a 14' tray ceilings with a fireplace, and large wall of windows that gives a wonderful view of the covered patio. Master bath includes a 6' garden tub, separate shower, and His and Hers vanities. Located upstairs is a large 16'x16' game room, media room, and ½ bath. 2-story home features a tile entry with 21' ceilings that extend past study and powder bath. Oversized 17'x23' family room with 21' ceilings, corner fireplace, and a full wall of windows. 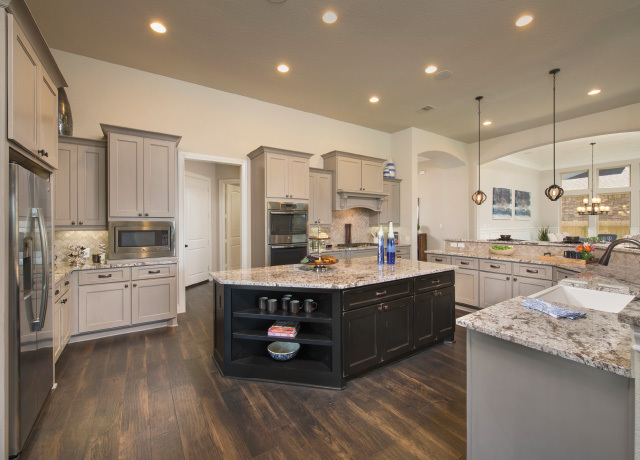 The open kitchen features 42" raised panel cabinets, granite countertops, and hi-bar seating. 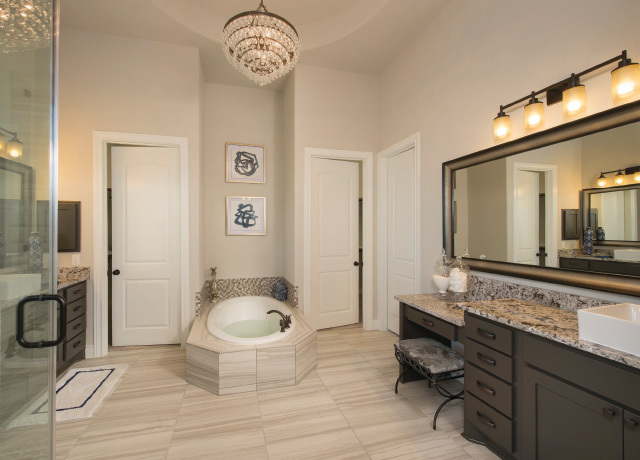 Master bath includes a 6' garden tub, separate shower, His & Hers vanities, and dual walk-in closets. Located upstairs are 2 bedrooms, 2 baths, media room, and a game room. Compact fluorescent light bulbs (CFL) throughout. Four hours of complimentary design service to complete your selections. 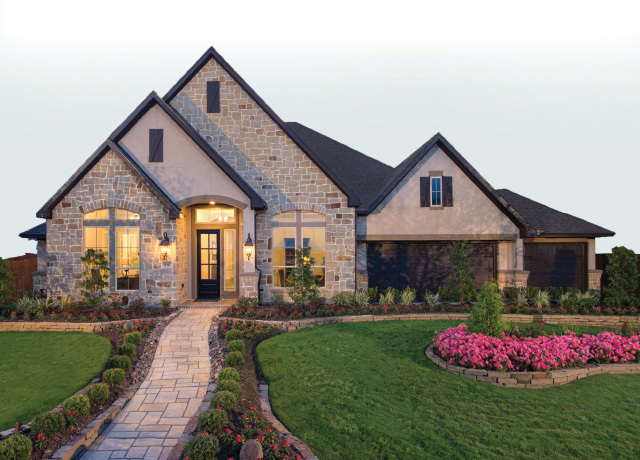 The Woodlands Hills is an approximately 2,000-acre master planned community, situated 13 miles north of The Woodlands® in Conroe and Willis, Texas. The development is in close proximity to Lone Star Executive Airport in Conroe, Lake Conroe and the Sam Houston National Forest. 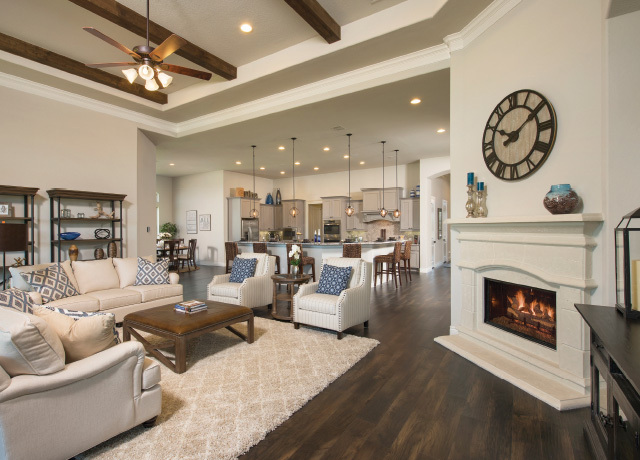 The Woodlands Hills is the third master planned community in Texas from The Howard Hughes Corporation® and is the sister community to the The Woodlands and Bridgeland®, two of the top-selling, award-winning master planned communities in Texas and the nation.